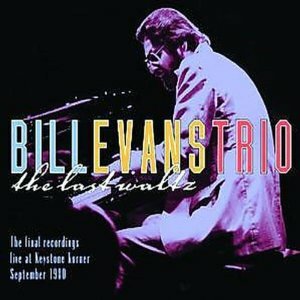 L ate in the summer of 1980, pianist Bill Evans played several trio sessions at San Francisco’s Keystone Korner. Marc Johnson played bass. Joe LaBarbera played drums. Evans knew he was dying, knew that these would be his last sessions. Fortunately, the sessions were recorded. Two weeks later, he was gone. The performances are wonderful. Evans’ work has always been described as lyrical, poetic, introspective, relaxed, and a kin to European salon music. In fact, I rediscovered the Last Sessions box after hearing one of Evans’ duets with Tony Bennett on the radio. When the albums was recorded, Bennett was just beginning to taste a possible comeback, and it was this album that led to his remarkable second-round success. I wrote: “Bennett was in his mid-fifties when he recorded this album in 1975. HIs voice is a tad husky and a bit light on the high notes, but his endless experience shapes and sells every word of every song. This adds meaning and depth to “Some Other Time,” “Waltz for Debby,” and other titles that had been in Evans’s repertoire for almost two decades. Evans’s accompaniment is perfect, and his solos are magnificent, fitting ever so perfectly between Bennett’s verses (“Some Other Time” includes a particularly fine example). Some songs such as “The Touch of Your Lips” and “We’ll Be Together Again,” are generally romantic and often sentimental.” The album was called The Tony Bennett/Bill Evans Album. There are lots of Evans albums, and most are still available. But the more I listen, the more I favor the Last Sessions box, partly for its intimate club feel, partly because he speaks directly to the audience from time to time, mostly because the work causes me to sit up and listen because it is so clean, so well crafted, and so compelling. Nicely recorded, too.